It is not often that I address a post directly to someone; in fact, this is a first! However, you so eloquently wrote your [count ’em] THREE comments to my post on the Birtch Street Bistro, that I felt you deserved some much needed attention. While I appreciate that everyone has a right to their opinion (as do I), I always find it interesting and entertaining when someone addresses me directly — making wildly erroneous assumptions and allegations. So thank you, John… you made my day and inspired me at the same time. So much in fact, that I thought the rest of my readers deserved a share of your overstated opinion. First the positive: I always love Birch Street’s atmosphere, and I go as often as possible on Thursday nights for the FREE live music by the EXCELLENT house band and their raucous guests. But ohhhh…I do wish that Mark would hire more staff! I agree that there is always a feeling that something is “missing”, and it always — at least for me– comes down to their chronic shortage of waitstaff. One additional bartender is DESPERATELY needed (at least on Thursday nights), and please please PLEASE hire more dining waitstaff, and ones that are hoping to actually EARN their tips!!! But, folks, why compare Birch Street to Sofia’s Grotto? Yeah, they both serve Italian stuff, but, c’mon, they are very different places, offering a very different atmosphere/experience. Sophia’s is a zillionth the size of Birch Street, the food is stock, the atmosphere is generic (faux everything), and, like that horribly clorox-laced sushi joint next door, the walls are unclean. Cockroaches on zee veranda? Girls, awaken! Have you EVER dined in Europe? Or the friggin’ BACK BAY??? Anywhere near any living tree, bush, shrub, flower, or drop of water? F.F.S. Seriously, wake up. GROUP SUGGESTION: Warn any potential BF’s that you’ll be a boring soulmate on any picnic, camping trip, or bear hunting misadventure. Me? I suggest you dine in the nearest sterile environment; Yelp “New England Baptist Hospital” and see what the gals there all say about Operating Room 3G — cleanliness to the max, and no cockroaches. Wear your best scrubs, nuff said? Yeah, choose wisely, grasshopper! Silly, silly women. Okay John… so this comment was not too shabby. You provided some decent feedback on the fact that Birch Street needs more wait staff… and skilled waitstaff at that. However, I never compared Birch Street to Sophia’s Grotto — a fellow reader did. But that’s okay, maybe you were speaking directly to them…. not me. I’ll give you that one. Next, you pointed out that we were overreacting about the cockroaches — after all, we WERE outside. I agree. I’ve lived in the city for many years and yes, have seen cockroaches (and rats) while dining on terraces and patios. That said… if you take into consideration our entire experience, the cockroaches were the icing on the cake. We were so frustrated by that point, that having cockroaches crawling around our feet upset us a bit more. Forgive us for not waiting gigantic bugs crawling up our bare legs (it was summer after all). On your last paragraph, you really began to let your true colors shine! Bravo! You’re right… maybe we SHOULD dine in a sterile environment. After all, who really wants disease-infested bugs, E Coli. covered hands or any microbe carrying creature near their food? Not I! Silly us… I guess we SO overreacted. Hmmm… I guess that’s just because we are a bunch of “BFs” and all “Girls”. OMG — How on earth did Yours Truly neglect to mention the reassuring reality that the those naughtie lil’ cockroaches did in fact agree to NEVER traipse onto Sofia’s Grotto’s eleven square feet of real estate on said patio extraordinairre! Ladies, they signed a contract! Honest !!! OOPS — that was 2009. Things are up for grabs in 2010, what with Scott Brown and all. Assume nothing, Earthlings (and Sofia’s enthusasts)! p.s. Where in heck IS that darn grotto? Okay. You seem like you really gave this one some thought, but John — I’m surprised that it took you 52 minutes to think of this. Really. You’re right though, I assume that Sophia’s may have a problem with cockroaches too… since they share patio space. However, we weren’t eating at Sophia’s — or as I mentioned above — we weren’t comparing our experience to there either. I do love how you used “OMG” to address me though, assuming I am some flighty, airhead that talks to my “GFs” that way. Nice job! I also love your dig about Scott Brown… as I agree with you on that one. Shame on Massachusetts — but that’s neither here nor there. Your final comment left me perplexed though… “Where the heck IS that darn grotto?”. So are you saying that a restaurant can only name itself something that is relevant? Maybe you are right. I think we should start a petition to close ALL restaurants in the city of Boston whose names imply something they are not! A bistro, sometimes spelled bistrot, is, in its original Parisian incarnation, a small restaurant serving moderately priced simple meals in a modest setting. Bistros are defined mostly by the foods they serve. Slow-cooked foods like braised meats are typical. Bistro patrons do not necessarily expect professional service or printed menus. Now it all makes sense!!! Birch Street is really small (NOT) and it has a “modest” setting (NOT). That said, we did not get “professional service”, so at least they are on target with that one. On behalf of your seventh-grade English teacher, please DO reevaluate your use of the word “your” in your title to your fun and interesting tale about the Birch Street Bistro. NB: Goddess Tammy, please, in the future, remember to spell “your” in this case as “you’re” (”…three strikes, you’re out!”), and, may we suggest using capital letters, as in fact you used it for a TITLE. Suffice to say, thank heavens you nabbed a guy who makes enough money to keep you blogging in your spare time. Touché! You called me out on my misspelling! Don’t worry John, I fixed it. And, funny enough (you are just going to LOVE this one) I am actually a professional writer. God, if that isn’t hysterical, I don’t know what is! I even changed the title to be all caps…. just for YOU, John. I know how much it meant to you, so I wanted to try really hard to please you — you being my biggest critic and all. Oh… and John? You REALLY should watch your own spelling. It’s extraordinaire, NOT “extraordinairre” and enthusiasts, NOT “enthusasts”… but I’m sure you were just typing really fast, trying to get your ideas on paper before they slipped out of your little mind. But why did you have to assume that my husband supports me? That’s where you crossed the line John. That’s where you declared war and inspired me to retaliate. 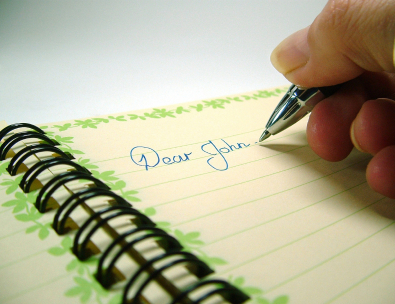 So John… dear John… I’m afraid I have to say PISS OFF. Let’s just leave it at that. 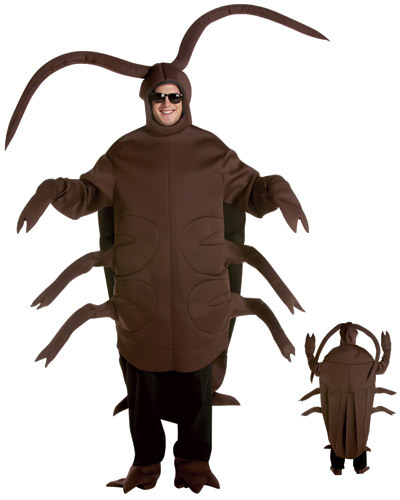 PS – I thought this might be a fun Halloween costume for you. You can thank me later.